NEW YORK, N.Y., April 27 (SEND2PRESS NEWSWIRE) — Paul Madonna, the San Francisco-based artist and cartoonist known for his “All Over Coffee” series, is exclusively releasing a detailed ink wash drawing through 20×200.com, the place to discover and buy art online. Titled “Studio, All Over Coffee #392,” the limited-edition print is an up close and personal look inside the artist’s studio, where he produces the beloved series of strips and other cartoons and sketches. Not only does the richly detailed print offer a creative, first-hand look at an artist’s workspace, it also speaks to Madonna’s adeptness at rendering detail-laden environments. From a Pez dispenser and gnarly-looking finger puppets to neatly organized inks and personal Post-it notes, the objects depicted in the print reflect Paul Madonna’s playful and thoughtful nature, prevalent throughout his series of comic strips. His renowned All Over Coffee strips are as recognizable for their stunning San Francisco cityscape imagery as they are for their thoughtful writing, which ranges from meditative musings to overheard conversations. Offering a blend of the appeal of comics with the depth of poetry, All Over Coffee is published weekly in the San Francisco Chronicle. In 2007, the first collection of “All Over Coffee” was published by City Lights Books. A new collection, “Everything is Its Own Reward,” followed in 2011. Paul Madonna’s Studio, All Over Coffee #392 is available exclusively on 20×200. The exhibition-quality prints start at $20 for an 8 inch x 10 inch fine art print (edition of 200). The work is also available at $50 for an 11 inch x 14 inch print (edition of 500), and for $200 for a 16 inch x 20 inch print (in an edition of 20). The new edition represents Paul Madonna’s fourth print release on 20×200. He previously released Balsa Planes #3, Balsa Planes #4 and Album 1. Originally from Pittsburgh, Pennsylvania, and a graduate of Carnegie Mellon University with a Bachelor of Fine Arts, Paul Madonna started his career as the first Art Intern at MAD magazine. He eventually moved to San Francisco, where he began drawing mini comic strips for free. Paul Madonna is best known for his weekly strips, All Over Coffee, that appear in the San Francisco Chronicle and SFGate.com, and also Small Potatoes, which is featured on TheRumpus.net. Paul Madonna’s drawings and prints are shown in museums, galleries, restaurants and cafes. His work, including his coverage of the U.S. 2009 Presidential Inauguration for several international newspapers, is published in various book collections and publications. He is currently the Comics Editor on TheRumpus.net and also teaches drawing at the University of San Francisco. With new limited-edition art prints introduced every week, 20×200 is the place to discover and buy art online. The site was launched in 2007 by gallery owner, curator, writer and entrepreneur Jen Bekman with this simple formula: (limited editions x low prices) + the Internet = art for everyone. 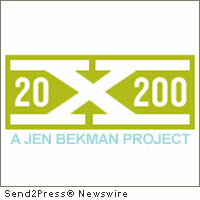 20×200 features a curated selection of affordable art online, enabling and encouraging a broader audience to buy art, become collectors and support artists. While the site’s signature art prints are 8x10s sold for $20 in an edition of 200, larger works are available at prices from $50 and $200 to $10,000. Every print is exhibition quality and is accompanied by an artist-signed and numbered certificate of authenticity. 20×200 works directly with more than 200 artists-emerging, established and legendary-giving each the incredible opportunity to share their work with the widest range of potential collectors. New artists and limited editions are announced every week. Newsletter subscribers get first access to the often fast-selling new releases and the curator’s story behind the work and the artist. For more information, please visit http://20×200.com . Original Keywords: artist Paul Madonna, drawings and prints are shown in museums, galleries, restaurants and cafes, 20×200 online gallery, gallery owner, curator, writer and entrepreneur Jen Bekman, exhibition quality and is accompanied by an artist-signed and numbered certificate of authenticity, All Over Coffee, New York business 20×200 New York New York NEW YORK, N.Y.
REFERENCES: Entertainment News, artist Paul Madonna, drawings and prints are shown in museums, galleries, restaurants and cafes, 20x200 online gallery, gallery owner, curator, writer and entrepreneur Jen Bekman, exhibition quality and is accompanied by an artist-signed and numbered certificate of authenticity, All Over Coffee, New York business 20x200 New York New York NEW YORK, N.Y.